Endoscope Cleaning Sponges, preloaded with Endoscope Enzyme Detergent Cleaners offer an additional margin of safety when Cleaning Contaminated Instruments. Tubular Shaped with internal bore for holding tubular devices, Multi-Use, Sponge, Loaded with highly concentrated all-in-ONE Endoscope Enzyme Detergents. The Cleaning Sponges deliver fast and effective pre-cleaning for: surgical instruments, scopes, respiratory devices, and bedside equipment. Nothing cleans as fast as the four Enzyme Surgical Instrument Cleaning Sponges. Nothing delivers surgical instrument and scope sponge cleaning power more effectively, guaranteed. The all-in-ONE Endoscope Cleaner 4 delivers the 4 enzymes needed to breakdown and remove all forms of proteinaceous bioburden. Four enzyme Surgical Instrument Cleaners are necessary to break down all forms of bioburden. Surgical Instrument Cleaners that do not deliver Lipase Endoscope cleaning Enzymes, Amylase Endoscope cleaning Enzymes, Carbohydrase Endoscope cleaning Enzymes, and Protease Endoscope cleaning Enzymes cannot remove all forms of surgical instrument proteinaceous bioburden. The single or dual enzyme endoscope cleaners cannot remove all forms of surgical instrument proteinaceous bioburden and they do not deliver the detergent surfactant agents that are critical for cleaning the surface of endoscopes. The ONEStep Surgical Instrument Detergent 4 enzyme detergent and easy FOAM-it Pre wash Instrument Detergent Cleaner, deliver the most effective surgical instrument enzyme detergent cleaner available. Nothing cleans faster or more effectively than the 4 Enzyme Surgical Instrument Detergent. Nothing will lower your cleaning costs as much as the all-in-ONE 4 Enzyme Surgical Instrument Detergent, and we guarantee the results. Enzymatic Endoscope Cleaning Sponges for cleaning Endoscopes fast. Replace multiple Surgical Instrument Care products. Endoscope Cleaners with Conditioners for cleaning and endoscopes fast and cleaning endoscopes with lower cleaning costs. The dilution rate is only .25 to .5 ounces per gallon for cleaning endoscopes fast. ONE product. ONE application. Apply it ONCE. It's all you really need for cleaning endoscopes fast. Replace enzyme cleaners, cleaning chemicals, stain removers, surface conditioners, and surgical instrument lubricants. Enzymatic enzyme detergent surgical instrument and endoscope cleaners are surfactant based cleaners and conditioners for breaking down proteinaceous soil, removing stains and cleaning endoscopes. 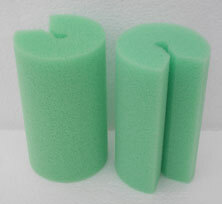 Enzymatic Endoscope Cleaning Sponges for cleaning Endoscopes. pre-cleaning and soaking Endoscopes, removing stains from Endoscopes, enhancing the passive layer to prevent corrosion, manually cleaning surgical instruments, ultrasonic cleaning surgical instruments, and automated cleaning surgical instruments. Endoscope Cleaning Sponges w/pre-loaded Enzyme Detergents. The Surgical Instrument Detergent enzyme detergent and easy FOAM-it Pre wash Instrument Detergent Cleaner, deliver the most effective surgical instrument enzyme detergent cleaner available. Endoscope Cleaning Sponges, preloaded with 4 Enzyme Detergent Cleaners. Pouch contains Sponge and 215 ml of the highly concentrated all-in-ONE 4 Enzyme Detergents. Pouch has a wide base pouch for stability and easy fluid transfer.